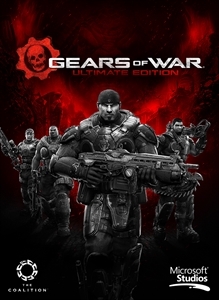 Welcome to the new Gears of War: Ultimate Edition Store! Pick from cool new items and returning classics, all re-Geared for a new generation. Celebrate Gears of War and show your fandom by outfitting your Avatar with these remastered items. Disguise your Avatar as a member of the Locust’s elite force. Theron Guards are more intelligent, powerful and accurate than Drones, Snipers or Grenadiers. And better looking. Frag out! Remember to gives yourself enough time to hide and take cover. The planet Sera is a dangerous place. Help your Avatar defend themselves from one of the most dangerous creatures in Gears of War using the Hammer of Dawn. Brumaks aren’t bad… they’re just driven that way. Let your Avatar take control of one of the most iconic creatures in Gears of War. Share your enthusiasm for Gears of War 4 with this hoodie featuring the game's official logo. Celebrate the first public appearance of JD from Gears of War 4 with this tee. The Lancer and Gnasher are two of the most iconic weapons in the Gears of War universe. Available in pristine white and grime-resistant black. The Crimson Omen remains the iconic symbol of the Gears universe. Look the part of a Gears of War pro player at a major event with this stylish jersey, featuring the official Gears eSports logo. An authentic replica of Marcus Fenix's COG armor from Gears of War: Ultimate Edition. Excited for Gears of War 4? Momentarily numb the pain of waiting by sporting this fashionable black tee. Enjoyed Gears of War: Ultimate Edition? Share your love for Delta Squad with this equally iconic item of clothing. For those who agree the only good grub is a dead grub. Show off to your friends that you are the biggest Gears of War competitive fan by wearing this tee, featuring the official Gears eSports logo. Time to get your head in the game and push for the championship with this elite Gears eSports baseball cap. The Gnasher is the weapon of choice for those who like their Gears battles up close and personal. Just remember the Golden Rule! Celebrate the memory of Anthony Carmine with this authentic replica helmet. DISCLAIMER: MAY NOT STOP BULLETS.